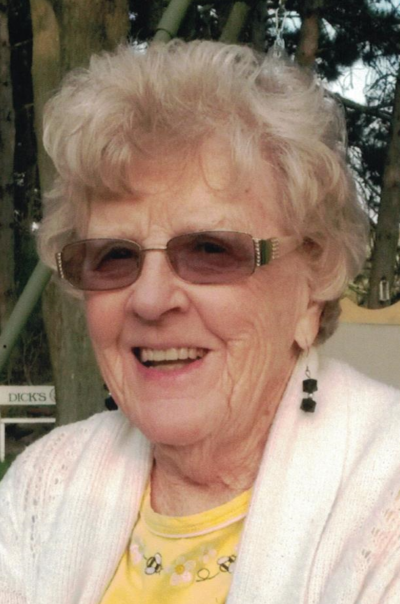 Beatrice L. Butler Hancock, 93, passed away peacefully at home in Eau Claire on April 27, 2018. Beatrice was born on November 15, 1924 to Mary Buchman and Lawton Schmitz in Paulding, Ohio. At 3 months of age the family moved to Westfield, NY where her father was employed at Nickel Plate Railroad. She attended school in Westfield until age 16 when her father was transferred to Madison, OH where she completed her schooling. There she met and married John Butler. Rev. Virant of Madison officiated. John was called to service in 1943, serving in the US Navy. They had 3 children, John Joseph, Richard Eugene, and daughter Judith Juniel Davenport. Beatrice was always active in the children’s activities all through their years of school even while working as a US Mail carrier for the earlier years and as an employee of Kroger later. John was employed by the Ohio State Patrol and the family moved to several locations in the state. All 3 children graduated from Delta High School and Beatrice’s most memorable day was in 1964 when all three children attended the high school prom and her and her husband were chaperones. They were blessed with 8 grandchildren: John Rhett Butler, Stacey Curtis, Joel Butler, Jeff Butler, Lyle Butler, Jamie Fletcher, Julie Roney, and Donald Davenport; 13 great grandchildren; and 1 great great grandson. Beatrice was widowed in 1995 and after 6 years she met and married a World War II shipmate of Johns from the ship “Phoenix”, John Hancock. She acquired one step-daughter, Susan Petschke; 4 step-sons, Mike, Donald, John, and William Hancock; 12 step-grandchildren; and 4 step-great grandchildren. She was preceded in death by her parents; husbands, John Butler and John Hancock; son, John Joseph Butler; brother, John Schmitz; sisters, Patsy Wise and Mary Lou Reilly, and one grand daughter at birth. She was active in her church, Women of Plymouth in Eau Claire and a member of the VFW Auxiliary Post 10405 in Altoona, WI. In lieu of flowers, donations to Altoona VFW Auxiliary Post 10405, 1419 Lynn Ave, Altoona, WI 54720 are greatly appreciated. Family members would like to thank the nursing staff on floors 3 and 5 of Mayo Health Systems and St. Joseph’s Hospice for their exceptional care of Beatrice. Memorial services will be held on Wednesday, May 2, 2018 at 11:00 am at Smith Funeral Chapel with Rev. David Huber officiating. Visitation will be held on Tuesday, May 1, 2018 from 4:00 – 7:00 pm at the funeral home as well as an hour before services on Wednesday. Burial will follow services at Lakeview Cemetery. Family and friends may leave condolences online at www.smithfuneralec.com. I met Bea through Emily Dittner. Emily was Bea’s hair stylist and I had my hair done either right before Bea or right after for a long time. Such a sweet person. I loved talking with her. She will be missed. My sincere sympathy to her family. I visited my Granny Bea last week and held back the words that I wanted to say. Before feminism, the Equal Rights Amendment, and Katherine Hepburn in Rooster Cogburn, there was my red-headed Granny Bea. You are far and away the strongest and most independent woman that I have ever known. Four generations of your descendants have learned by your example. The virtues of faithfulness to family, thoughtfulness in planning, trust and charity among friends carried their weight for me. We are now all the better for having you as a mother, grandmother, in-law, and matriarch. And, I see all of your virtues in the descendants that you have created. Especially in the strong and independent women, whom I am most proud to know. Even in those that don’t carry your red hair. Bea was such a vibrant, loving and very caring individual. Everyone who knew her, loved her. Our thoughts and prayers are with her and her family.